Peiyan.Photography: What I gave to my kids. What I gave to my kids. Today marks the end of my teaching practicum. The 10 weeks passes so quickly. To "thank" the students for their cooperations and fun times, some of the practicum teachers decided to do something for our students. It was tough to think of what things to get or make for them as we do not want to have any repetition of gifts. 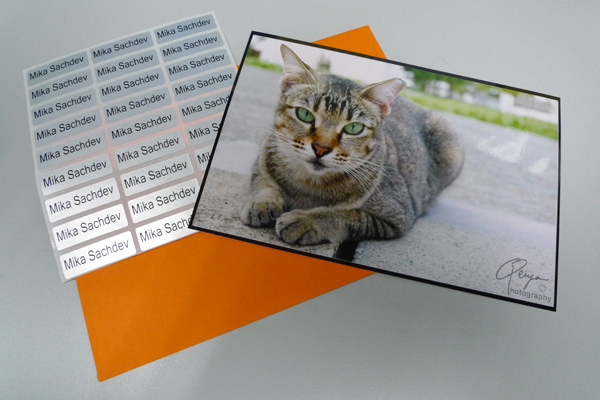 Since my sec 1 girls loved my cat images so much, I decided to print one for each of them. Like wise, I thought that it would be an interesting gift to give them one of my photography works. and sec 3 received a sunset image. The set my sec 1s and 3s got looks like this. It comprises of a name sticker and a photo. Behind the photo is a little message written by me (thought it's standard wordings for all). I'm sure the girls are touched by the little gesture from me, just like the little notes they wrote for me. Similarly, I did the same thing for my two co-operating teachers (forgot to take pictures of them). Thank you for making my practicum a memorable one. Don't worry, I'm coming back. What the kids gave me.